Get the essence of fall when you bite into this healthier, dairy-free and nut-free spiced pumpkin bread, scented with cloves, cinnamon, nutmeg, and ginger. In eighth grade my classmates and I were allowed to take a cooking elective. This was long before I was interested in becoming a dietitian. I certainly never thought I would be a cookbook author and spending the majority of my time in the kitchen whipping up new recipes. I don’t remember most of what we made in that class, but I do have very vivid and fond memories of making pumpkin bread in time for Thanksgiving. I was a picky eater back then – frozen chicken nuggets, pizza bagels, and lots of Entenmann’s treats made up most of my diet, despite my mother making healthy meals on a nightly basis (sorry mom!). My pickiness resulted in my skepticism of pumpkin bread, which is funny to think back on considering how much I love it and other pumpkin-based recipes like my Healthier Pumpkin Pancakes, pumpkin muffins and oatmeal, and Pumpkin Spice Yogurt Sauce. I pretty much love all things pumpkin these days, and, so it seems, does most of America. That’s why I know you’ll love this moist, easy, and healthier version of spiced pumpkin bread. While I held on to my eighth grade recipe for many years, I somehow lost it and my brother and nephew took over making pumpkin bread for our family Thanksgiving dinners. I decided it was time I start making my spiced pumpkin bread again and given that I’m a little more experienced in the kitchen now than when I was 13, I can play around with recipes to make them a little more nutritious while maintaining their deliciousness! And that’s exactly what I did with Bon Appétit’s Spiced Pumpkin Bread recipe. I loved all the spices in the original recipe, but didn’t like all the sugar and oil, plus I wanted to get in some whole grains and the fiber that comes with them. So I made some tweaks and tested it out on my husband’s co-workers for their office pot-luck Thanksgiving lunch. I was very pleased with the end result and so were my hubby’s officemates! What’s especially great about this recipe is that it only takes 15 minutes to prep and it makes two loaves, so you can freeze one for later or treat a friend or loved one to a loaf of her own – it certainly makes for a perfect gift to bring to someone else’s Thanksgiving dinner! Get the essence of fall when you bite into this healthier, dairy-free, nut-free spiced pumpkin bread, scented with cloves, cinnamon, nutmeg, and ginger. Preheat oven to 350 degrees F. Coat two loaf pans with non-stick cooking spray and set aside. In a large bowl, whisk together sugar, oil, and applesauce to blend. Mix in the egg, egg whites, and pumpkin. In another large bowl, mix together the flour and the remaining ingredients. Stir dry ingredients into pumpkin mixture in two additions. Divide batter equally between prepared loaf pans. Bake until toothpick inserted into center of loaf comes out clean, about 1 hour to 1 hour 10 minutes. Transfer to wire rack and cool 10 minutes. Using a sharp knife, cut around edge of loaves. Turn loaves out onto racks and cool completely. 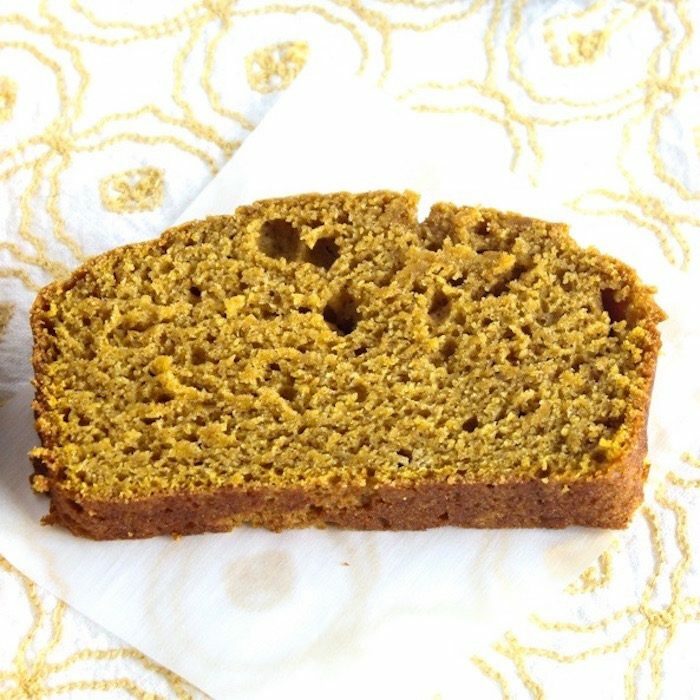 Spiced pumpkin bread freezes well. Wrap in aluminum foil prior to freezing. Do you have a recipe from childhood that you still enjoy making? Pumpkin bread is one of the best! It’s right up there with the good old classic banana bread! Haha..i’m probably the only person on earth who doesn’t like banana bread (it’s the banana part, not the bread! ), but I know what you mean! You will get a softer product if you add the oil right before you finish mixing. These pics are so cute! Love pumpkin bread Jessica and yours looks divine! Thanks Sara! Have to give all the photo credit to Kaleigh @ Lively Table! Doesn’t she take such gorgeous shots?! Have a wonderful weekend! We loved this bread! So yummy! I am so glad! Thanks again for taking these gorgeous pics! ‘Tis the season! Hope you give this a try and enjoy! Have you made this with whole wheat pastry flour? It’s all I have & I would love to make this. Looks fantastic! ”Tis the season! I haven’t, Kim, but I don’t see any reason it wouldn’t work. Lmk if you give it a try! This definitely looks like it tastes like fall! Omg drool…amazing updates to the recipe. All those spices are so perfect together. I have a pumpkin date bread coming soon and I’ve been making it over and over, so good. Yours sounds sooo yummy too!! Thanks Deryn! Those are my favorite spices for baking! 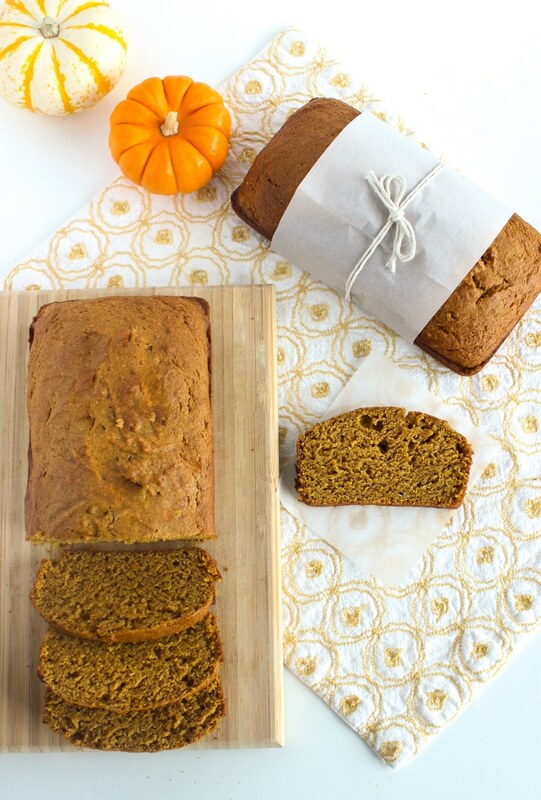 Can’t wait to see your pumpkin date bread – sounds delish! I haven’t tried spiced pumpkin bread before! I’m adding this to my list to to-makes! Hope you enjoy it Carmy! I love all the warming spices in it. I can almost smell this baking 😀 Looks delish! The house smells so good when it’s baking! THAT sounds so good! I’m getting into baking so much more, i will deff need to try it out. Thanks Ana. To be honest, I’m not the biggest baker, but quick breads are really easy. Hope you try it and enjoy! It just looks so dang perfect!! And moist. Oh man, with a little melted butter on a slice of that – HEAVEN! Aw thanks GiGi! And you’ve got the right idea with that butter on top…mmm.. This looks so yummy! I love homemade breads! Thanks Kalee. Nothing like them! I love that you got exposure to cooking in school as well. I was always in the kitchen with my mom or grandma but would have loved a class as well! Thanks! A perfect classic for the fall! So obsessed with pumpkin things right now, but haven’t made pumpkin bread yet! Love that this recipe is a healthier version. Yum! ‘Tis the season! Hope you try my version soon! I need to head straight to the kitchen and bake this up! Be great for the neighbors too! Yes you do! And such a nice gift for neighbors and friends. This looks so moist & perfect for a fall baking day! I’m all about the baked goods right now! So many delish baked good options for the fall! That’s so awesome that you got to take a cooking class in school when you were young! This bread looks so delicious! Beautiful pictures. Sounds amazing too! I’ve never baked pumpkin bread before! It’s time for that to change Nazima! Thank you! Definitely a fall favorite in this house! This is a cake. 2 cups of sugar?!?! “healthier” pumpkin bread my foot! The recipe makes 2 loaves of pumpkin bread, so there is 1 cup of sugar per loaf, which is in line or less than most pumpkin bread recipes.